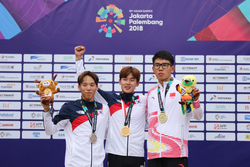 Korea and China shared all six medals at the 2018 Asian Games Modern Pentathlon competition in Jakarta, Indonesia, winning one title each. Zhang Mingyu (CHN) and Jun Woongtae (KOR) claimed the golden glory while three other Koreans and one Chinese athlete joined them on the podium after fighting off the challenge of rival nations such as Japan and Kazakhstan. Jun (KOR) lived up to his billing as world No.1 to take the Men’s Individual title by a 13sec margin over Lee Jihun (KOR), with Luo Shuai (CHN) securing bronze after a tight contest with Li Shuhuan (CHN). Zhang (CHN) held off a strong Korean challenge in the Women’s Individual Final led by silver medallist Kim Sehee and bronze medallist Kim Sunwoo, the champion securing gold by a margin of 25sec. Japan duo Rena Shimazu and Natsumi Tomonaga finished 4th and 5th respectively. During his visit to the Asian Games, UIPM President Dr Klaus Schormann engaged in a series of high-level discussions with fellow members of the Olympic sports community, including Sheikh Ahmad Al-Fahad Al-Sabah, President of the Olympic Council of Asia (OCA). Dr Schormann presented medals to the winners of the women’s 100 metres (athletics) and women’s under-62kg (ju-jitsu). 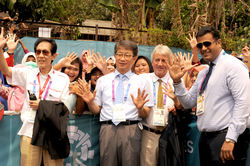 He also attended the Asian Modern Pentathlon Confederation Assembly on August 30 and made a speech at the opening of a new pentathlon centre in Jakarta.